Building a line of defense to protect our waters of the East Branch of the Brandywine Creek (EBBC). The east branch of the Brandywine is located in an area that forms a drainage basin which is the largest in the county, encompassing 290 square miles and accounting for about thirty-eight percent (38%) of the county's land area. No place along the Brandywine is far from water - the land and each action carried out on the land - is inextricably tied to its waters. Whether it is out local streams and tributaries, our freshwater streams and wetlands, these waters provide drinking water, food, and habitat for people, plants, aquatic life and wildlife. Plus these waters along EBBC provide enormous recreational benefits for all Pennsylvanians. Protecting our present riparian buffers and the need to continue to line these waters with native trees and grasses in the form of riparian buffers is a vital step in the efforts to protect the East Branch of the Brandywine water resources. We need your help in creating a line of defense to protect our waters here along the EBBC. Riparian buffers are transition areas between water and the land. They link terrestrial upland ecosystems to stream, river or wetland ecosystems. The buffers we need to protect are the areas that are thickly forested along the streamside area. Although we can plant new buffers, we need to enact legislation to protect our present buffers along our 'high quality' streams as they serve several important functions. The Science is In! Forested Buffers are our Best Defense! Buffers reduce flood damage. Forested buffers reduce flooding impacts by increasing storage and infiltration of floodwaters and slowing flood velocities. Buffers protect drinking water. Forested buffers filter out pollutants and battle drought - protecting both water quality and quantity. Buffers decrease costs of stormwater management. Protecting our present buffers in new land development can reduce or eliminate the need for large and expensive stormwater infrastructure, such as storm sewers and detention basins. Buffers filter pollutants. Only forested buffers filter significant amounts of pollutants including sediment, nutrients, toxins, and other contaminates. Pollution removal is maximized when forested buffers widths are over 100 feet or greater. Buffers reduce stream bank erosion. Root systems of forested buffers stabilize stream banks and slow down runoff to prevent bank scouring and erosion. Buffers cool waters for aquatic life, cool streams by 4 to 9 degrees F. Shaded and cooler streams means healthier streams, particularly for many temperature-sensitive fish such as trout in our UEBBC. Buffers are needed to enhance stream habitat for fish and other aquatic life. Leaves, sticks, and other debris from forested buffers provide food, shelter and habitat, increasing biological productivity from the base of the of the food chain and up. Buffers battle climate change. Forested buffers help reduce the impact of climate change by absorbing greenhouse gases. These suggestions were provided with permission from the Campaign for Clean Water for PA - www.pacleanwater.org. 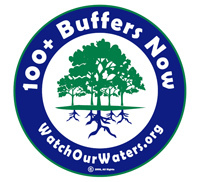 Download the PA Campaign for Clean Water's flyer: "Buffers 100 - Beside every good stream is a good buffer" to share with your friends and neighbors so they too can understand the impact and the importance buffers will have on the Upper East Branch of the Brandywine. is to protect and create healthy buffers along our streams, creeks, wetlands, and rivers. Then download this 24 page guide "Protecting Streams in PA" and gain background information and useful tips for securing stronger local protections for the East Branch of the Brandywine. The Delaware Riverkeeper Network was kind enough to provide us this guide and are a great resource. Support 100 foot plus buffers for the Brandywine. Buffers are a source of economic capital, preserved and protected they mitigate stormwater naturally. They are nature's best management practice.